April 3, 2008; Page B11 ON STYLE By CHRISTINA BINKLEY Wall Street Journal: Norsk Leather & Fur in Park City, Utah, recently supplemented its displays of beaver and lynx throws with something new: a fur pitched as eco-friendly. The fur comes from the brushtail possum, a marsupial native to Australia that has become a forest-destroying invasive species in New Zealand. Fur marketers argue that buying furs made from the possums they kill actually benefits the environment. 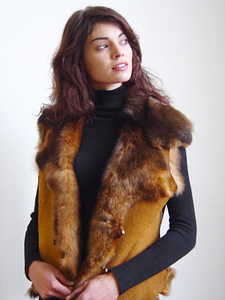 “All of the luxury, none of the guilt,” is the catchphrase of Eco-Luxury Fur LLC, which markets the fur Norsk sells. There is just one problem: None of Norsk’s possum throws have sold yet. The appeal to the environmentally conscious “sounds like a good idea,” says manager Paul Zembruski, “but the people who will buy this kind of product don’t care.” There lies the contradiction for eco-fur, the latest attempt to capitalize on the public’s desire for blameless pleasures. Luxury commerce is urgently pursuing do-gooder status. We have already seen organic clothing and vegan shoes. Vacations to faraway South Pacific islands are sold as eco-luxury; Lexus’s hybrid SUV is billed as environmentally friendly. Of course, plastic sandals billed as “vegan” or “vegetarian” could just as easily be called “petroleum-based.” Furthermore, some of the claims of environmental benefits are a stretch. Bamboo is sold as eco-friendly because it’s quickly renewable, but bamboo fiber requires heavy processing, and the clothing often undergoes baths in toxic dyes. This entry was posted on April 3, 2008 at 8:42 am and is filed under Uncategorized. You can follow any responses to this entry through the RSS 2.0 feed. You can leave a response, or trackback from your own site. I have never heard anything more ridiculous than the fur trade’s “green fur” or “eco fashion”. The fur trade’s known image is red for blood and raw carcasses after the animals’ skins and fur have been ripped off. Our wildlife is a very important part of the eco-system. Trapping and killing millions of fur-bearing animals year after year from the eco-system, in the name of “fashion”, causes potentially critical damage to our environment. Consumers should be critical of so-called “green” claims. We need to question just how green it is to unnaturally rip the skins off millions of animals in our eco-system and soak them in chemical bath to prevent decaying and growing of bugs.